To be the first to hear about upcoming Competitions, Member Discounts, Special Offers etc., sign up for our WoofAdvisor Newsletter - just an email required! Our prize, generously sponsored by the stylish Moville Boutique Hostel located in Moville on the Inishowen Peninsula in Donegal, is for a two-night break for 2 people with up to 2 dogs in a room of choice! The voucher is valid for use until 14th November 2019. There are no black-out periods or excluded dates, but booking is essential as the hostel does book up fast especially for summer dates. Moville Boutique Hostel will send the voucher directly to the email address provided by the winner, plus some helpful information for planning a dog-friendly stay in the area. Go to https://www.facebook.com/WoofAdvisor/ On our Facebook post for this competition, share somewhere dog-friendly you've been in Ireland, UK or further afield - can be a Hostel, Cafe, B&B, Pub, Glamping, Restaurant, Hotel, Holiday Cottage.... you choose! You also need to share our Facebook post for this competition with 3 friends. Closing date / time is Sunday 18th November at 9pm GMT. Winner will be picked at random at this time. Judge's decision is final and binding. Moville Boutique Hostel is a Family & Pet-Friendly Hostel, Apartments and Campgrounds in the coastal town of Moville, Inishowen, Co. Donegal on Ireland's Wild Atlantic Way. 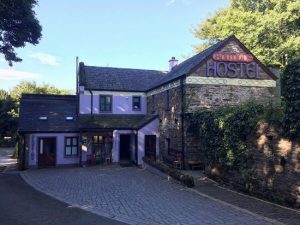 The hostel is a converted farm building now offering uniquely decorated private rooms, family rooms, apartments and pet friendly accommodation featuring original stonework throughout. Guests are welcome to use all hostel facilities including the kitchen/dining area, the library/TV room, games room, garden and free WiFi. Click on image to see full hostel details.